I like a challenge. So when Sam Sifton of the New York times posted an article and recipe on British meat pies, I knew I needed to make one. You might be saying “hold on Jes, aren’t meat pies…well, made of meat?” Verily. But I never let main ingredients stop me from veganizing things that should probably never be veganized. Can anyone say crepe cake? Thankfully this one didn’t take quite as long as the crepe cake and thankfully the result was just as tasty (in a savory kind of way). But let us stipulate right from the start: meat pie for our ­purposes today is beef in dark, silky gravy composed of fat and reduced stout, flecked with tender vegetables, covered (if not encased) in pastry, served alongside peas and, perhaps, mashed potatoes. Cooked on a dark February afternoon as low clouds scud across a distant horizon, meat pie will fill your home with good cheer and the promise of contentment across the table at dinner. Eating it — salty and rich, buttoned with sweetness — will occasion thoughts of a coming walk or a nap on the couch with the dog, in equal measure. You’ll want some red wine to drink. I’ll redescribe the original recipe: beef, trotter gear, suet, beef fat, beer. Ew. 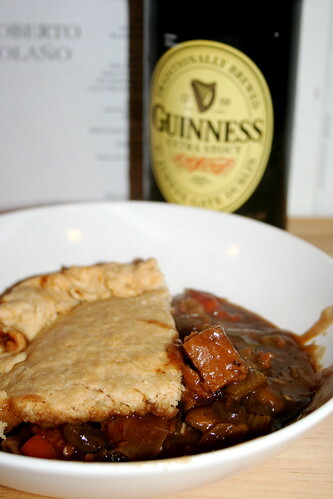 My take includes seitan, veggies, and Guinness simmered down to malty perfection, topped with a flaky pastry crust. Sounds tempting right? The consensus is that I need to start a vegan gastropub and this meat pie ought to be on the menu. I could go with that. If I didn’t have to work ridiculously long hours for no pay, that is. For now, I’ll stick with this pie, warm slippers, and a cat on my lap. And trust me, I’m dreaming of the day when Spring finally comes and flavorful, colorful vegetables are an option! Sift together the flour, baking powder and salt into a bowl. Using a pastry cutter or your hands, quickly work the Earth Balance into the dough until it is the texture of coarse meal. Add ice water, a splash at a time, until a firm dough forms. Wrap the dough in plastic and refrigerate for at least 2 hours. While the pastry is cooling in the fridge, cook the onions in 2 tbsp olive oil in a stock pot over medium heat for 5-7 minutes until soft. Add the garlic and cook for 1 minute more. Add the carrots, celery, mushrooms and remaining 2 tablespoons olive oil and cook over medium heat, stirring frequently, until the mushrooms are dark in color and the moisture released by them has evaporated, about 15 minutes. Add the seitan, flour and rosemary to the pan and cook over high heat, stirring often, for about 5 minutes. Add enough Guinness to just cover the setian. Cover the pot with a lid, bring to a boil, then reduce to a simmer and simmer the Guinness for 1 hour. Stir occasionally. After 1 hour, remove the lid and cook for an additional 15-20 minutes, until the liquid has reduced. Remove the pastry from the fridge and place it two sheets of plastic wrap and. Using a rolling pin, roll to the thickness of a computer mouse pad. Pour the stew into an 8-inch-square, 2-inch-high Pyrex dish or a deep 9-inch pie pan. Place the dough on top of the pie and pinch it closed around the edges using the tines of a fork, then slash the center lightly with a knife. Place on a baking sheet and bake for 45 minutes, or until the pastry is puffy and golden. Haha love the warning That pie looks AMAZING!! I found a Guinness cake not long ago that I’ve been absolutely dying to make…I think my sister’s 21st birthday in April will provide the perfect opportunity! i have never had a “meat” pie but yours sounds intriguing! Hello! I love your blog and have made a few things from it. Thought you’d want to know that Guinness isn’t vegan, at least not in the US. It uses isinglass (fish blatters) in the filtering process. Looks very authentic- And I mean that in the best way possible! seitan is such a great beef substitute! i love this recipe! This looks amazing! I’d love to tuck into that (but I *am* trying to fit into a bikini!)! Talk about comfort food — love it! I might just have to try this as an antidote to the gloomy winter weather. Thanks! I had to wear a bikini yesterday, in fact, but as my friends here in Australia keep eating meat pies I just may have to make this when I return home (and put the bikini away until our summer)! ooooooooh! this looks so fantastically amazingly awesome, Jes! i’m gonna have to make this soon – before it warms up. here i am bitching about the cold weather and now i’m hoping we get another cold day at some point so i can make this pie! ahahaha! and it IS supposed to warm up this weekend – superw00t! man, i want this pie RIGHT NOW! ummmm yeah, after reading what that sam guy has to say about it and literally drooling, i don’t think there’s any option left BUT to make this pie. ‘cept without guinness, because i kinda hate it. sorry! Ooooo. Mr. Beagle LOVES stout. We’ll have to try this! I hate that Guiness isn’t vegan, too. We have an organic/vegan stout that I buy sometimes when I really miss it. Stupid people and their animal parts obsession. Speaking of obsession…think I could get me one all over that pie! mm that looks like a great pie – i used to love steak & ale pie in my omni days. i’m sure there must be a vegan version of guiness available around here somewhere!! must have a look. unhealthy, and not low-fat? count me in. I’m wearing my sweatpants just for the occasion. whoa- I am so there at your vegan gastropub. That looks so great! That looks amazing!. I was very dissapointed when I found out that guinness wasn’t vegan. I am in the comfortable situation that I don’t have to give up beer because of that. Fortunately, German beers are always vegan. So I might make your pie with one of my favourites soon. How devine! I’m a huge fan of making veganized British Meat Pies. Dude. I love Guinness AND veganized meat pies with a fiery passion. Can’t wait to give this recipe a go! I’d be totally down with opening a vegan bakery like your gastropub, if I too didn’t have to work long hours hours for little pay (grad student)!! Though I’m not a fan of Guinness (I know, I know), my sister is…and she might be very interested in learning of this pie! Thanks for the recipe!! I tried this yesterday. I used St-Ambroise Oatmeal Stout from McAuslan Brewery and Yves brand “Beef Tenders”. Turned out great! Thanks for sharing the recipe! MMMmmmm sounds totally delish, will have to get on to hubby to bring some suitable beer/stout home to give it a go! Please save me a seat if you ever do open the Gastropub! all of samuel smith’s beers are vegan certified, and they make an excellent stout, if that helps anyone.